Revolution OS jest filmem dokumentalnym który powstał w 2001 roku. Przedstawia on dwadzieścia lat rozwoju GNU, Linuxa, Open Source i Ruchu Wolnego Oprogramowania. W filmie są wywiady z wybitnymi hakerami i przedsiębiorcami takimi jak Richard Stallman, Michael Tiemann, Linus Torvalds, Larry Augustin, Eric S. Raymond, Bruce Perens, Frank Hecker and Brian Behlendorf. Reżyserem jest J. T. S. Moore. 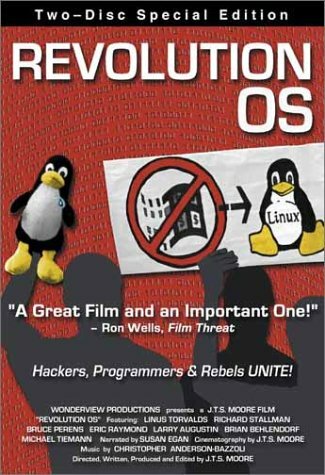 Thank you for sharing the review of the documentary film “Revolution OS” which is based on the development of GNU/Linux for about past 20 years. I have watched it and I think it tells the life of Richard Stallman, founder of the GNU project.